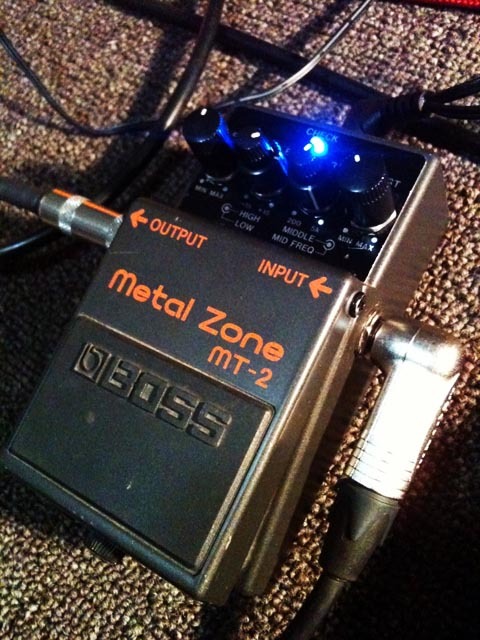 The Boss MT-2 Metal Zone, sounding so much better now. I decided to revisit the previous mods I had done to my Boss MT-2 as I wasn’t completely happy with the sound as a distortion pedal. It was nice as an overdrive, but I was more interested into making it a great distortion box. As in my earlier post about modifying the MT-2 I had tried one 1N4001 diode and one red LED, as well as two LEDs. I wasn’t quite happy with that so I decided to install two 1N4004 diodes. I was having a look over the other changes I had made, and when I looked at the PCB I realised that I had accidentally removed the capacitor fromC24, not C25. I had also jumpered the two removed capacitor locations, where after some further reading I realised that I had misunderstood some things. After getting rid of the jumper wires, and placing the capacitor back in C24 I was back to where I should have been with my modifications thus far. I also decided to change C36 from a 0.1uf MKT capacitor to a 1uf to make it take on the characteristics more reminiscent of a Marshall amplifier. I tested one LED and diode again and decided that the two LEDs were so much better. These three mods remove the harshness somewhat. This makes the sound more dynamic and full. This makes the EQ more useful. With these changes I found the pedal sounded much tighter and clear. I’ve been able to get my modified MT-2 to sound kind of similar to my Blackstar HT-5 dirty channel, which I’m quite happy about. Here is a comparison audio file to show what my modified Boss MT-2 sounds like compared to a stock one. Both pedals are dialled up with the same settings. First is the stock MT-2, second is my modified MT-2, and third is the dirty channel on my Blackstar HT-5. Apologies for the crackly audio, my cable and microphone aren’t the greatest. 13 Responses to "Modding the Boss MT-2 – part 2"
Thanks for this. It’s always nice when someone puts all the info from the forums into an easy to read guide. Just one thing: you say that the 2 leds sounded so much better but further down you say you replace d3 and d4 with 1n4001 diodes, so im kind of confused. what should i use? Thanks dude for the 1n4004 diodes…to my ears in other mods they did sound better, maybe asymmetrical 1n400X+1n4148. I no longer have the MT-2 but i’ll get a rocktron metal planet, which is THE SAME pedal, only R41 from what i noticed quickly is 1k , where R41 in the metal zone is 4.7k. Even the part numbering is the same in some parts. I tried the above modifications, but so far haven’t heard much improvement in the pedal. I’ll test it again tonight, but I’d also like to confirm some of the details of the mod. For C35 and C25 are the caps removed and a jumper put in their place or just removed? For D3 and D4 I’ve only found 1N4004s diodes in my local store are these suitable replacements for the 1N4001s? Can you confirm that the replacement for C36 was 1uf and not 0.1uf which was mentioned in the original post. Hi there, thanks for your comment. With regards to the caps, yes, just remove them. No need to jumper. I actually had a typo (corrected now), I installed 1N4004s as that’s what my local store (Jaycar) had. Should essentially do the same thing. Thanks for the diode confirmation. I also purchased my components at Jaycar. I’ll open up the pedal again this weekend to check my soldering and swap the on/off LED. and thanks for posting this info. hey i just finished your mod (with pair of 1n4007 as clipping diodes) + swaped few caps with MKT for better quality but still my mt-2 sound hissy, any ideas? Hi, I’m going to make this mod but I have a doubt, how shall I place the diodes? I mean, in which direction? I readed somewhere that how you place them is quite important for the sound you get. Yes diodes need to be placed in the correct orientation for the circuit to work correctly. The circuit board from memory should indicate which way, matching up with the marker on the diode. Mod sounds great man. It gets rid of that weird super tight boost in the 2-6k region (makes it sound like there’s a stationary wah somewhere in the chain) which is why I rarely use mine for recording. Are the 2nd and 3rd takes with the distortion knob cranked? The third sounds much thicker, but I also hear more hiss than in the second. Just the difference in the recording/amp volume or is the hiss one of the trade-offs for that great bass? Thanks! Hey Buddy thanks! As listed in the text, the sample is firstly a stock MT-2, then the modified MT-2, and then the dirty channel of my HT-5.